Don’t take those bear selfies in Aspen, Colorado! Those folks will fine you! The humans’ constant harassment of the bears in their homes has caused the Aspen City Council to vote in a new ordinance called the Wildlife Harassment Ordinance. Those who are caught posing with Yogi Bear and his family will be fined $250 for the first offense, $500 for the second offense, and $999 for the third offense. According to the good folks over at Aspen Times, the city council folks said that the last straw on the camel’s back came after a group of humans chased a mother bear and her cubs up a tree. The good men and women in blue, Aspen Police Department (APD), managed to secure the area, giving the mother and her cubs enough time, nine hours to be exact, to feel comfortable enough to come down. And right after the mother's and her cubs’ paws landed on the ground, here comes a female human running towards them with her iPhone. The sight of the human with what the bears saw as a foreign object caused the bears to scatter like roaches and to make the good men and women in blue madder than a rabid dog. In other words, these fools don’t know that nature can take over and they will be over if they mess with the wrong bear. And this is true because not all bears are like Yogi the Bear or those bears on Dr. Doolittle. There are bears out there that don’t know anything about trying to help you prevent forest fires and aren’t interested in talking to you via a veterinarian who can talk to them. Most bears are bears and their thing is survival of the fittest. If the bears believe you are a threat to their house and family, the bears will go all nature on you and you’ll become dinner for two; or three, depending on how many bears are part of the bear's family. The point is that bear selfie will become just an e with the e standing for eaten. Yep, you’ll be lunch. Just as some folks over in India who thought taking a bear selfie was all right. A fella in India got out of his car to take a piss, saw a bear, decided to mess with it, and it then decided to eat him for lunch. The folks over at Hindustan Times said a stray dog tried to help the fella out while his friends in the car just sat there, with their iPhones, taking a picture of the bear eaten him. The good news is the stray dog lived. Although that fella was mauled to death, he did learn a valuable lesson that he can take over into his next life. And that lesson is don’t mess with bears because they will mess with you back. 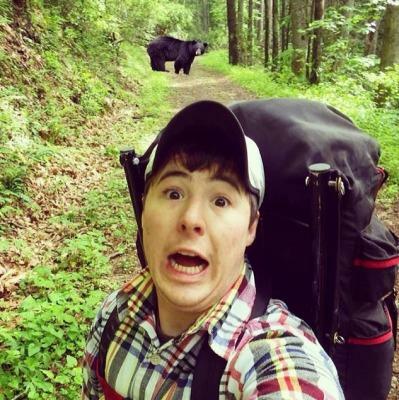 Stay away from those bear selfie’s now.